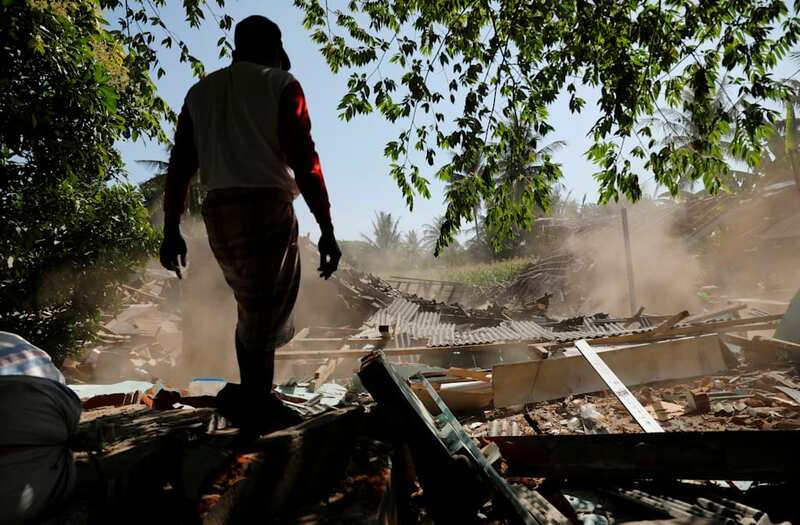 A magnitude 6.3 earthquake rattled the Indonesian island of Lombok on Sunday, just two weeks after a temblor killed hundreds of people in the region. The U.S. Geological Survey (USGS) measured the quake at a depth of 5 miles (8 km) below the earth's surface, with an epicenter 36 miles (58 km) from Mataram, the island's capital. The earthquake was felt strongly in East Lombok, with people reportedly running into the streets screaming and crying. according to Aljazeera. There have been no immediate reports of injuries or fatalities. The temblor triggered landslide in hilly areas, but the extent of damage is not clear at this time, according to the Associated Press. The island is still reeling from a magnitude 6.9 earthquake that struck on Sunday, Aug. 5, which killed over 400 people, destroyed tens of thousands of buildings and displaced hundreds of thousands of people. Indonesia is located in the Pacific Ocean's Ring of Fire, an area prone to frequent earthquakes and volcanic eruptions. Foreigners help to evacuate a woman following Sunday's earthquake on Gili Trawangan, Lombok, Indonesia, August 9, 2018 in this photo taken by Antara Foto. Antara Foto/Zabur Karuru/ via REUTERS ATTENTION EDITORS - THIS IMAGE WAS PROVIDED BY A THIRD PARTY. MANDATORY CREDIT. INDONESIA OUT. A man guides a horse onto a boat to transport it to the mainland following Sunday's earthquake on Gili Trawangan, Lombok, Indonesia, August 9, 2018 in this photo taken by Antara Foto. Antara Foto/Zabur Karuru/ via REUTERS ATTENTION EDITORS - THIS IMAGE WAS PROVIDED BY A THIRD PARTY. MANDATORY CREDIT. INDONESIA OUT. An Indonesian policeman and his dog search for earthquake victims inside a collapsed building in Pemenang, North Lombok, Indonesia August 8, 2018 in this photo taken by Antara Foto. Antara Foto/Zabur Karuru/ via REUTERS ATTENTION EDITORS - THIS IMAGE WAS PROVIDED BY A THIRD PARTY. MANDATORY CREDIT. INDONESIA OUT. Foreigners clean up the damaged parts of their restaurant after Sunday's earthquake on Gili Trawangan island, North Lombok, Indonesia August 8, 2018 in this photo taken by Antara Foto. Antara Foto/Ahmad Subaidi/ via REUTERS ATTENTION EDITORS - THIS IMAGE WAS PROVIDED BY A THIRD PARTY. MANDATORY CREDIT. INDONESIA OUT.